Some of the most popular posts you’ll ever read online are List Posts. There is something about them that draw people in like moths to a flame. One thing about List Posts that make people love them so much is that they’re not just one type of post; they’re not one-dimensional. List posts can be about anything. Cats, puppies, cars, blogging, money — you name it, and it can be part of the topic. But why do they work? I mean, think about it. You’re scrolling through Google search about something (it can be anything) and then — boom! Right there half way down the page, your attention is snatched by something with a number in the title. You hover your mouse over to it, click the link and read the page. Did you ever stop to wonder why you do that? Why is it that a list post will seize the attention of a viewer so quickly and then prompt that response? Saying, “Because they just do,” may be enough to satisfy most peoples’ curiosity. However, if you want to learn how to create these types of posts that get high click through rates and social shares that could make your post go viral, then learning the science behind the magic is crucial. But seriously — why do we love these kinds of posts? Well, it all boils down to what our brain craves. As humans, we are inundated with terabytes upon terabytes of information through our senses every day, and our brain is continually working in the background to organize that information into something understandable and actionable. What do we do after that mental reaction? That reaction is part of the reason amazing list posts go viral. Want to see examples of such articles? Here is another man who has learned how to write list posts correctly. 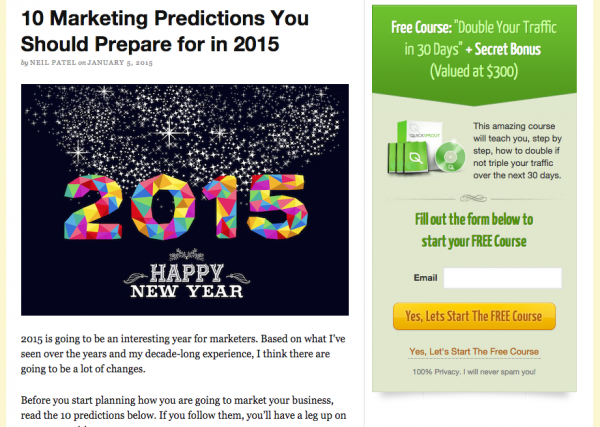 Neil’s post that listed marketing predictions for the year was published back at the beginning of January 2015. The result? Why did these posts take off like Road Runner? Well, some may argue that the biggest reason behind their success is how well-known and connected these blogs and bloggers are. To a certain degree, that is true, but there is so much more to it than just that. A great list post has less to do with who is writing it and more to do with what it has to offer the audience it is written for. Did you catch that? Good. Now, go back read it again. For as true as that point is, there is still more to creating a list post that people will gobble up. In fact, the best of these types of articles come from a recipe that few have learned. Since many don’t know the correct way to create these, more often than not, their list posts fail — miserably. Many who attempt these posts, don’t realize the amount of planning and crafting that need to go into them. Some think that if they just tack on a number to a post title, it will launch into the realms of internet popularity, but they soon have that idea brutally slapped down. Creating and crafting these is not as easy as many may think. But if you take the time to learn how to do them right then you can start to master the art, and you can begin creating some of the best content on the web. The post examples listed above combined all of these ingredients to create amazing, evergreen content. If you study their posts and others of a similar caliber, you start to get a sense of what ingredients they used and how you can copy it. The title of your post can make or break the whole thing. If your title lacks the key features to grab attention, then everything else you try on the list is going to be pointless. So how do you craft the perfect list post title? Now ask yourself, why did this title work and what about it worked so well? Well, consider Jon’s audience. People who come to his blog or this blog post came to it for one main reason: money. More specifically, they came to it to learn about making money from blogging and to learn it from someone who has been able to do this successfully. Topic of Interest | Blogging — it’s one that resonates with his personal audience. Therefore, it generates the initial urge to read it. Strong Words | Make Money – couple this to the topic that his audience wants and now you have their attention. Numbers | 20 … $100,000 — these are the things that will stand out. The brain makes the connection between this, the Topic and something that will help make everything easier. A Silent Promise To Learn Something | When you go and read the post title in full, what does it tell you? 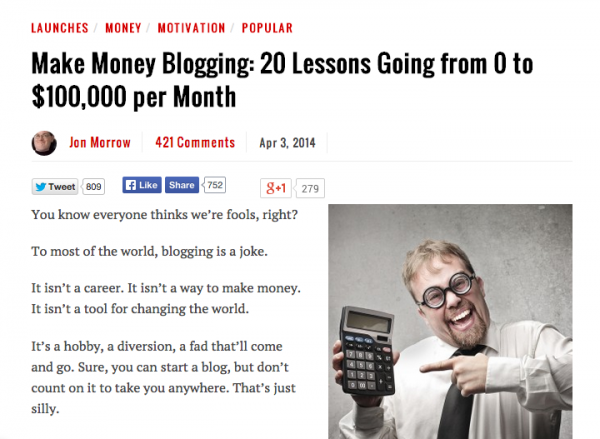 It tells you that the post teaches 20 lessons from someone who makes $100,000 every month from blogging. Why is that interesting? Because the word, lessons, tells the brain that you will learn something about how to accomplish similar results of someone like Jon. Topic of Interest (Health) + Strong Words (Making Us Sick) + Numbers (10) + Promise To Learn (What’s making you sick? The post will show you.) = Conversion. 3 Warning Signs That Your Significant Other Is Cheating On You | This throws up a red flag on a topic and people will pay attention. Blogging Got You Down? Here are 7 Tips To Put Some Pep in Your Step | Tips and lifehack type posts always have an audience. 15 Productivity Secrets That Every WordPress Site Owner Should Know | What has the world been hiding from your audience? Reveal it in your post. See how versatile this is? The formula can be used on just about any list post, but you have to take the time to craft the title correctly. Remember, the title can make or break your post. Therefore, before you even start writing a list post, spend a good amount of time coming up with titles that take this formula into consideration. Once you’ve narrowed down the list and picked one out that you feel will work, then it’s time for the next steps. Your new list post idea can be likened to a lump of clay: you have something to work with, but it’s not much more than that. To turn your post into a real work of art, your need to the spend time creating the points in your list. These can and should take some time to create. If your post title promises to list 7 items of something on your topic, then you need to have 7 points that are interesting and stay on track with the article. This could require research since you want to make sure to create something unique. After you have created the points for your lists, you can move on to the writing portion of your post. This is another area you want to get right, or you could lose your audience. Once you start listing your points, be sure you keep your paragraphs under each point short and to the point. If you have 3 points in the list, then you can get away with slightly longer content — say, 4-5 paragraphs with 2-3 sentences each. List Posts don’t have to be boring, and they don’t have to be a flop. Am I saying that using these points will automatically guarantee your post will go viral? No — no one can promise that. However, if you treat this type of content as an art that you are passionate about learning and gaining the right skills at, then you have a higher chance of creating posts that rival the other popular ones on the web. Last year I wanted to be creative and had a shot at making my annual Top Blog Posts for 2015 interesting by weaving an old Christmas memory of mine and also providing a narrative for the selection with a few lines for each post that made the list. This was around Christmas and to my pleasant surprise, it was a hit and gave new life to some old posts that I am convinced are evergreen. The blog post didn’t go viral but the reader was happy and for once, I actually got comments for the post. I’ll be trying your tips this month for another post that I have coming up. Great post, especially the part on the headlines. Wow! Thank you, Ariel. You will never know how timely your article was for me and how it has changed my perspective on where I need to go with my website! Thanks for great tip. This is my homework for my next post!